Sisters Ramya and Malyada Goverdhan grew up in one of the oldest Vaishnava temple precincts dedicated to Andal (Alvar saints of South India) in Vrindavan. They saw fabric and food grains being offered by the devotees, who would come to pay their respects to the deity, from across the country. “We would look at people’s attire and try guessing which part of the country they are from,” says Malyada. Thus, it was no surprise when the duo opened a clothing store, with the focus being mainly on handloom and handmade items. Today, almost 15 years later, their venture Hands of India (HOI) enjoys a lot of popularity, with local textiles getting a contemporary outlook. 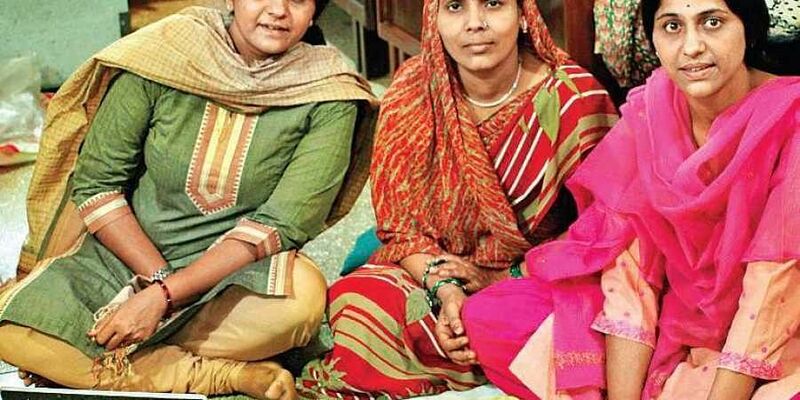 that’s how we gravitated towards handmade,” says Malyada, who has worked in the software industry, while Ramya has completed a five-year stint with the Indian Air Force. To develop the brand, the sisters zigzagged around the country, working with embroidery groups in Kanyakumari, Odisha, Andhra Pradesh, West Bengal and Uttar Pradesh. Their products are 100 per cent cotton with kantha (West Bengal), kasuthi (Karnataka) and other hand embroidered forms from Kashmir and Uttar Pradesh being added to their list. “There’s a lot of hand printing too (dabu, ajrakh) and kalamkari (Pedanna in Andhra Pradesh) with vegetable dyes blending itself well with western silhouettes. Our biggest selling range is bandhani,” reveals Malyada and adds that they have tried their hand at chikankari on handloom fabrics on brighter shades such as yellows and reds compared to the pastel shades and the transparent mulmul fabric. But HOI is currently facing the challenge of scaling up. “Normally, we see that those working with these artisan clusters typically open an NGO. But we’ve invested our own money instead of opting for grants and loans. Also, any artisan group typically takes about two years to achieve the desired level of quality and finesse. Our kurtas come with a six-month guarantee with our embroiderers being made to understand that they have to take guarantee of the thread colour so that it does not come on to the fabric,” says Malyada. While the handloom tradition dates back 5,000 years, according to Malyada, the society is frittering away its ‘intelligent capital’. “The market has been inundated with Chinese brocade which is one-tenth the cost of the original brocade. Nobody even knows what the real Banarasi brocade looks like,” she rues.